VideoPoker Game Terms, part 2 continues with these unique terms for these strategy games: Cowboys, Dirty Royal, Double Up, Kickers, Deuces Wild Video Poker and Multiplay. Part 2 concludes with Extra Video Poker Quiz Questions. Catching Cards: deals/draws are going your way. A very good thing! Complete Hand: term for straight, flush, full house, quad and/or straight flush combination. Credits: paid for winning hands or an initial bet placed and displayed on the credit meter. Cycle: mathematical possibility of receiving the top jackpot of a royal flush. Example=Royal occurs approx. every 40,000 hands for Jack+ 9/6 VP versions. Deal/Draw Button: press for replacement cards not held during play or to deal new hand. 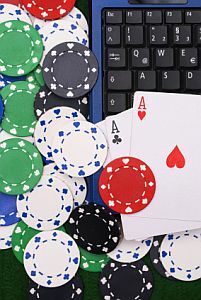 Definition: VP games, except Deuces Wild, are referenced by the full house and flush payout for one coin. Example=9-6 Jack+ game pays 9-for-1 for full houses and 6-for-1 for flushes. Deuces Wild 9-5 refers to straight flush and 4-of-a-kind payouts. Denomination: most VP slots offer several denominations options, from nickels to $25. Deuces Wild Video Poker: 4 Deuces pays 1000 coins for this version. Dirty Royal: jargon for royal with 1 or more Deuces, payout is lower. Discard: cards tossed in search of a better hand. Double Bonus VP: 10/7 versions pays 50 coins for a full house with max. coin in play. Double Double Bonus VP: 4 aces with 2, 3 or 4 kicker pays 2000 coins. Double Inside Straight Flush: three cards in the same suit with two gaps where two cards will complete a straight flush, example=7c, 9c, 10c, 3d, 4h. Double Up: side bet option to double credits for a winning hand. You must draw a higher card than displayed to win. Expected Value or EV: average return expected with optimal strategy. Example=Jacks+ choice between 4 cards dealt for a possible straight and at the same time, 4 cards dealt for a possible flush. You would choose the 4 cards to a flush as the expected value is higher. Expert Strategy: method of deciding which cards to hold and which to discard for each VP version considering the best chance of winning the hand. Flush (fl): five cards all the same suit—clubs, spades, hearts or diamonds. Four of a kind or Quad: four cards of the same denomination. Example=4 aces. Four Card Flush: four cards of the same suit in a VP hand, example=2c-8c-5c-Jc. Four Card Inside Straight: four cards in any suit with one or two gaps. Example=6-8-9-10-Q. Four Card Inside Straight Flush: four cards of the same suit with one gap wherein 1 card will complete a straight flush, example=7c, 8c, 10c, Jc, 3d. Four Card Royal Flush: four cards in the same suit where one card will complete a royal flush, example=10c-Jc-Qc-Kc-7d. Four Card Straight: four cards not in the same suit in consecutive order with both ends open. One card (6 or J) will complete a straight with 7c, 8s, 9h, 10d. Four-Card Straight Flush: four cards in the same suit in consecutive order with both ends open. One card (6 or J) will complete a straight flush with 7c, 8c, 9c, 10c. Full House (fh): hand containing three of a kind and a pair. Example=AAA-22. Full-pay VP (fp): game that displays the best pay table. Example=Jacks+ 9/6. Games/hour: 500/games/hour is an average for VP players. Hand: five cards as dealt or held constitute your hand. High Card: refers to jack, queen, king or ace. Most VP games will return your bet for a pair of jacks or better. Hold Button: pressed for each card you choose to hold for that particular hand. Inside Straight: completed with one card only, example=Dealt 6, 7, 9, 10 where only the 8 can produce a winning hand. This is a good bet if completing a straight flush or royal. Jacks or Better/Jacks+VP: 2 pair pays 2 coins or 10 coins when max. coin in play. Joker Wild VP: 5 of a kind usually pay 1000 coins. The wild joker is required to complete this winning hand. Kicker: fifth card held or dealt that pays additional credits with 4-of-a-kind. 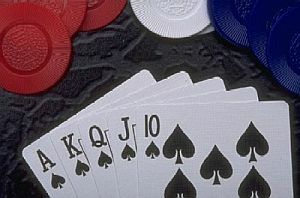 Example=2, 3, or 4 with four aces in Double Double bonus poker. Kicker: holding an additional high card with a small pair. Not recommended. Max Bet Button: pressed when you bet the maximum coins for a hand. Usually a 5-coin bet. If you choose not to play max. coin, you will not qualify for the larger jackpots. Maximum Payout: if you bet 5 coins for each VP hand, all winning hands are paid out multiplied by a factor of five, except for the royal flush. Royals offer a higher payout of usually 4000 coins as a bonus reward for playing max coins. Multiplay: VP slots where you can play 3, 5, 10 or up to 100 hands at one time. 9-6 or 8-5: definitions used to describe VP versions. Example=9/6 for Jacks+ is full pay while 8/5 Jacks+ describes a short/partial pay version of these strategy games. Optimal Play: requires a combination of maximum coins in play plus strategy techniques utilized for that specific version with a full-pay VP table. Outside Straight or Straight Flush: completed with two possible cards, example=dealt 6, 7, 8, 9 where a 10 or 5 will produce a winning hand. 1) Which two Video Poker specific payouts determine a full-pay Deuces Wild VP Version? A. Full House and Flush. B. Full House and Quad (4-of-a-kind). C. Straight Flush and Quad (4-of-a-kind). 1) C. The full-pay Deuces Wild VP version is determined by the payouts for Straight Flush and Quads. The Deuces Wild version of 9/5 is usually considered full-pay, therefore when playing maximum coin of 5, a Straight Flush will pay 45 and a Quad will pay 25 coins. This is Part 2 of 3, VideoPoker Game Terms at gamerisms with extra video poker quiz questions.